Since 1987, the Kids Who Care Awards have recognized the unselfish contributions of young people who dedicate themselves to making our community a better place. 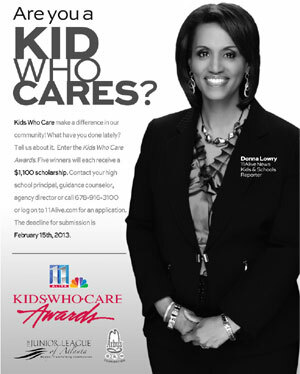 (Nomination Form) Kids Who Care Awards are made possible by 11Alive, Junior League of Atlanta and the Arby's Foundation. Each year, five high school students are selected based on their service to a local organization or cause. In order to be considered, a student must be in grades nine through 12 and perform a service to the community that is not school-related. Winners will receive an $1100 scholarship and a certificate of Excellence. They will also be recognized on 11Alive and honored at the Junior League of Atlanta's Annual Meeting in the Spring. In order to nominate an outstanding teen for the Kids Who Care Award fill out the nomination form. You will need Adobe Acrobat Reader to view the nomination form. Nomination forms should be sent to WXIA-TV, One Monroe Place, Atlanta, GA 30324. For more information, call (404) 873-9177.